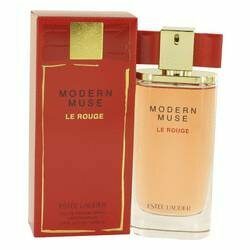 Modern Muse Le Rouge Perfume by Estee Lauder, This fragrance was released in 2015 a rich fruity floral perfume that lasts for hours. let this blend take you on a dreamy adventure. the aroma is so pleasing for you and all those around you. absolutely captivating. the top notes are black currant bud, pink pepper, raspberry and saffron. the heart notes are bulgarian rose, romantic jasmine, may rose and magnolia blossoms. the finishing notes are vetiver, madagascar vanilla, patchouli and rosa centifolia.